A total quality system, easy to use with loads of power for the ultimate decks 'n' FX DJ set. Superior build quality. Great feel and layout. Four deck mixing and looping. For the first time we get to play with four-deck control over Serato's Itch software. DX's slim design means it fits easily in a record bag or backpack. The Xone series has been instrumental in changing and expanding the way DJs perform for over a decade. The DX is the range's latest DJ Mixer/MIDI Controller/Sound Card combo. It differs from previous offerings such as the similar spec'd Xone:4D by being specifically tailored to work with the included Serato Itch DJ software. Itch has been out for a while now, and has established itself as a rock solid performer alongside hardware from Vestax and Numark. "With tight looping tools, FX and hands on control you've got the makings of a sweet decks 'n' FX set." What makes this special is that this is the first time we get to play with Itch across a full four decks. Combine that with tight looping tools, FX and hands on control, and you've got all the makings of a sweet decks 'n' FX set. The close partnership means once the software is installed, there should be no set-up time as every controller is pre-mapped, with all controllers labelled and ready to be tweaked. The DX is slim-line; with a depth of 50mm it easily slips into a backpack or record bag for transportation. Every knob, fader, switch and button feels solid - all the controls are fitted to small PCBs, which are then mounted to the top plate. This has the benefit of making all the knobs and faders wobble free, and if anything goes wrong, it will be easier to repair or replace a specific bit. The four-channel mixer features a three-band EQ, assignable cross fader and full headphone monitoring. The mixer is integrated with a 20 channel USB 2.0 soundcard which features four sets of stereo analogue inputs on RCA. Three of these have selectable inputs, two have phono preamps and the third can take a feed from the XLR mic input. This is located round the front and is only suitable for dynamic types and has a dedicated EQ with high and low bands. The mixer channels can listen to either the analogue source or one of the digital decks, but not both. The dual FX section runs from the software but you can process the signal from the analogue inputs as well. There's one more input round the back for a 3.5mm stereo jack that feeds straight into the mixer and bypasses the software. This is designed so that if there happens to be a problem with the soundcard during a live show, you can have an iPod on backup to keep the music playing while the soundcard reboots. There are four pairs of outputs designated for Cue, Booth, Aux and Master (which is duplicated on the balanced XLR outs) plus stereo digital over S/PDIF and Optical. Last but not least, round the front you'll find a headphone slot. Sound quality is up to the usual A&H quality and latency is minimal so response is tight and up there compared to hardware CDJs. The layout will be intuitive as it follows the standard decks on the outside, mixer in the middle setup. Almost every function can be directly accessed on the mixer and has its own dedicated controller - be it fader, button or dial. 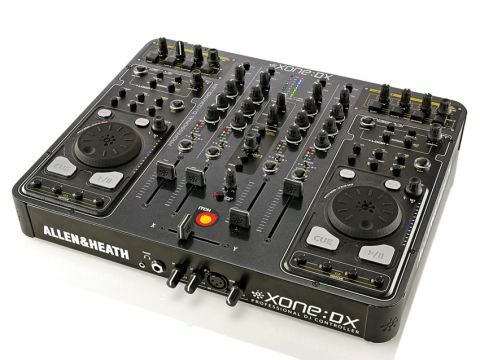 The only doubling up is on the decks, where each of the two hardware decks can be used to control two virtual counterparts by way of a layer switch. On the plus side, this keeps the cost down and the footprint to a minimum. A colour-coded system is employed to keep track of which deck layer is the focus - whereby LEDs glow and blink either green or red to differentiate one form the other. Almost every control on the unit spits out MIDI commands, so the DX can also be used to control other DJ software and apps, but you'll need to spend some time working on the mapping. All the usual transport and playback options are available too. This includes key-lock, quart-lock, forward and reverse playback - which is also labelled 'Censor' in case you are playing back explicit material and happen to be DJing at a children's party. The trick with the reverse function is that when you release the button it resumes playback from the point where the track would have reached if it hadn't been reversed. This means it always stays in the groove and in sync with other tracks in the mix. Pitch adjustments are made via a notched rotary dial, and you can make fine adjustments by twisting it, or coarse ones by pressing down the knob and then turning it. While it's possible to load tracks straight into the decks using the DX's dedicated knobs or by dragging them from the finder, Itch doesn't always guess the tempo correctly. This can mess up the auto-sync and looping tools so there is an off-line analysis mode. Here you can get your collection in shape by setting the tempo and beat grid precisely. Serato tell us a free update is in the works that will be dropping by late summer. This should add number of nice new features that will definitely be welcomed. First up is a true scratch mode for the jog wheels, to go with the bend, scrub and skip modes. The cross-fader will add adjustable curve control and there will be a 'cue mix' option for headphones to add to the normal and split modes. While all updates are promised for free, the price of the system is on the higher side. That said, you definitely get what you pay for here - hardware that oozes quality and is built to perform, and rock-solid software that sets the standard for others to follow.